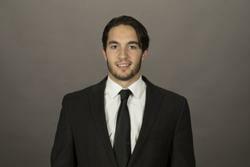 Glenview Stars alumnus Louie Belpedio, now a standout junior Division 1 hockey player for the Miami Redhawks, is a 2017 Hobey Baker Memorial Award nominee. Vote for Belpedio today and every day (once per day) through March 16 on the Hobey Baker website. Belpedio, a 1996 birth year player who is now captain of the Miami Redhawks, is a 6-0, 201 lbs. defenseman from Skokie who played all of his AA hockey for the Stars. He went on to play for Team Illinois and the U.S. National Team Development Program on his way to Miami (Ohio). Belpedio was drafted by the Minnesota Wild in the third round of the 2014 NHL Entry Draft. Hobey Baker Award Nominees must exhibit strength and character, both on and off the ice; contribute to the integrity of the team; display outstanding skills in all phases of the game; show scholastic achievement and sportsmanship. The Stars are proud of Louie and all his accomplishments and know he deserves this award. Louie is in the top row of the Hobey Baker Award voting website -- vote for him today and every day through March 16!